Home networks are demanding these days. Gone are the 10/100 days. Now everyone needs/wants a gigabit network. The problem is price. 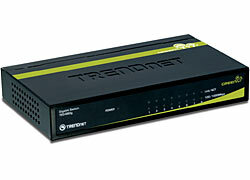 I love the Trendnet Teg-S80G switch. They work great and can be had for under $40. I was using the Netgear GS-608 gigabit switches but had more than a few issues with them. The Trendnet switch is also well made, the case is metal. They have plenty of LED's to indicate connectivity and speed. The multi-colored LED will indicate if you have a gigibit connection. FYI, gigabit networks need Cat 5e or Cat 6 cables.